When I start to sink, Kota reminds me to keep going and holds my space. Kota is my guardian angel. He follows me around and holds my space. When I am too caught up in the negative, he nudges me and brings me back to the present with his beautiful black nose. It's like he is saying, "Pet me and forget about your woes, let's go for a walk." I have not sunk into depression, although many say I should have. When I start to sink, Kota reminds me to keep going and holds my space. You all saved my life. It continues to amaze me when I am around these Veterans we serve. 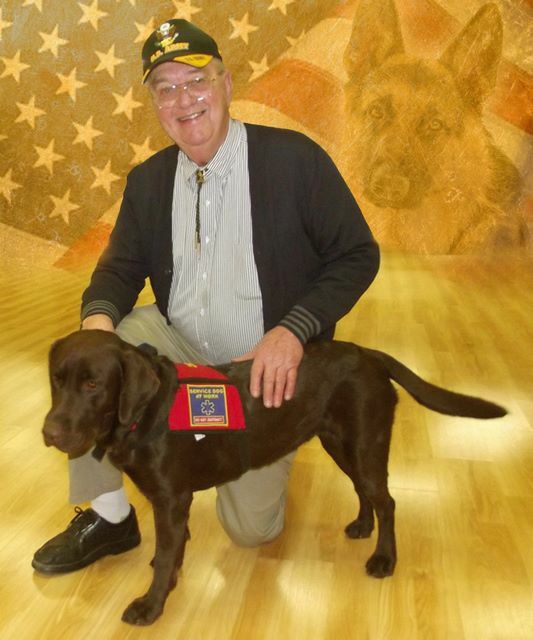 A number of them needed a Service Dog because of PTSD or MST. They had the normal symptoms of isolation, hyper-vigilance, fear and anxiety. With a Service Dog a bridge has formed allowing them to return to a more productive and fulfilling life. It used to be, after my first tour of duty, that I hated going out places. I didn't like being around civilians, and I was most comfortable in uniform, with my fellow Soldiers around. I could still go out, though, because I knew that I could get up and leave where ever I was, when ever I decided it was time to go. I was injured during training for my last tour in Iraq, but I fought through the pain to deploy with my Soldiers. Suddenly I found that I couldn't leave when I wanted to, and my fears and anxiety of being caught in a crowd during an attack where getting worse. My temper was getting more out of hand, and I was isolating myself in my home. When Gunner came into my life, suddenly I didn't feel like a target; I didn't feel as though I was the center of people's focus when I went into a store. Instead, they saw Gunner first, and he became my buffer. I still find myself panicking at Walmart and HEB, but Gunner will scoot up close to my leg and stand there to let me know that I am not alone. After only a few weeks of getting Jake, Jaime Cole was able to sleep for a few hours on a night when her husband was away at reserve training. The next day, she was able to travel to Lampasas to meet with me by herself (without her husband or daughter along). These are things she hadn't been able to do since returning from Iraq. I never knew I had an anger issue until one day I was on the phone. I must have raised my voice because I noticed Suzie ran off into another room. She peeked around the corner after I hung up the phone and came running to me, jumped into my lap and started licking my face. I felt so bad because I knew she thought I was yelling at her. I now try to control my anger and give credit to Suzie for making me aware of my anger issue. That to me is unconditional love. My daughter got to go to the movies with a friend, and experience being a real kid. I have credited Jake with interrupting several, formerly debilitating anxiety attacks. And last week, when I passed out from an attack, alone, except for Jake, I awoke on the floor to find him licking and nudging me awake. Jake has forever changed my life and I will forever be grateful.